Ben Carson is a retired neurosurgeon, hawker of “cancer curing” vitamins, amateur Egyptologist, and former presidential candidate. He is also, apparently, Donald Trump’s pick to lead the Department of Housing and Urban Development. There are a few reasons why Carson is an odd choice for that post. For one thing, he has absolutely no experience in urban development, aside from having spent his developing years in an urban environment. For another, his personal assistant declared him unfit to run a federal agency last week. My own personal theory is that Joseph built the pyramids to store grain. And various scientists have said, “Well, you know there were alien beings that came down and they have special knowledge and that’s how they were” — you know, it doesn’t require an alien being when God is with you. That Trump appointed Carson despite these facts suggests that his preference for empowering loyalists over qualified professionals knows no bounds. 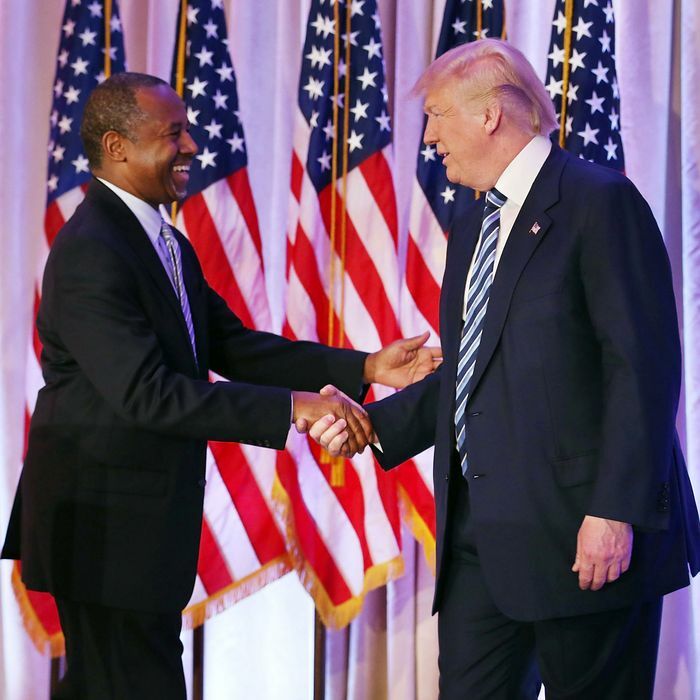 Although, if Trump sees HUD primarily as a tool for enriching well-connected real-estate developers, Carson’s combination of loyalty and ignorance may make him uniquely “qualified” for the position.